Filters are an advanced feature that allows you to better control the data read from sources or published to other services. We support filters for all primary data our system operates on. You are synchronizing your data with CyclingAnalytics, but only want to copy data which you were biking on. You can add a filter for Classified As and select Cycling. Before November, you used to do the synchronization manually. You can tell FitnessSyncer to filter out any data before a particular date by adding a filter for After Date and select the appropriate date. You only want to synchronize data above 2 miles; you can tell FitnessSyncer to filter out data Distance Less Than 2 miles. You wish to use FitnessSyncer just for Daily Summary Information such as Steps and Heart Rate; you can add a Has Summary Information as your filter. The list of filters varies depending on the task type. The complete list is in the user interface. If the Only if match all? checkbox is checked, all of the top-level filters must be true in order for the item to be removed. In other words, this operates as an AND operator for the filters. If it is not checked, then any of the values being true will remove the item. Another advanced feature for filters is that you can add parentheses to make conditional operations, such as saying you want tasks that are after a particular date which contain either one term or a distance. In this case, the last two conditions would be in parentheses and you would select OR from the selection box. The easiest way to test your filters is that after you have saved the source or destination, edit the source or destination again and at the toolbar, select the Export Option () to “Download Sample CSV”. This will download at least the last 30 days of items with the filter applied. 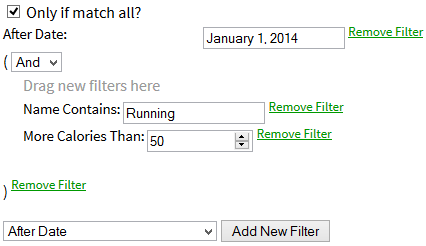 If the data is not filtered to your liking, update the filter again, save, and repeat. If you have any problems or questions on the filters, please feel free to contact us.